OZEN by Atmosphere is located on the island of Maadhoo. The two halves of the resort are connected by a wooden bridge. As you make your way over the bridge you may spot sharks and stingrays swimming below. On one side of the resort are the famous overwater villas dotted across the lagoon. You could even ride a golf buggy if you’d prefer not to walk. On the other side, you’ll find a bar overlooking the infinity pool. As the islands are so tiny the crystal clear waters are never far away. This resort offers a flawless combination of style and luxury. 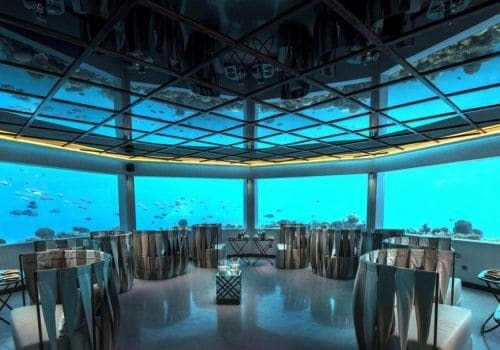 It even boasts an underwater restaurant. These spacious villas are elegantly designed in light, nautical colours. All come with an outdoor deck and private tropical garden. The bathrooms are excellent – monsoon showers are always a winner. If you upgrade you can get your own private pool. North of the island you’ll find the wind villas dotted along the lagoon. The surrounding waters are arguably the bluest on earth. Staying in an overwater villa is a bucket list experience for many. OZEN’s villas are among the most elegant you’ll find. If you’re looking for something more spacious The Earth Family Suites are ideal. You’ll have 35 sq.m of living space, a separate living room, a large master room and a second room. Both bedrooms have a private bathroom. There’s also a spacious outdoor veranda. Ideal for family getaways. If you’re looking to take luxury to the next level the OZEN Water Suite is ideal. Located at the tip of the pier, this three bedroom suite is truly regal. It comes with a private gym and even a maid’s room – you know, in case you’re travelling with your maid. The outdoor pavilion is an ideal place to watch the sunset. Ozen by Atmosphere is an impeccable luxury resort. It’s the slice of paradise everyone wants when they go to the Maldives. Unlike some luxury resorts, this one is not stuffy. The decor is vibrant and the staff are very friendly. 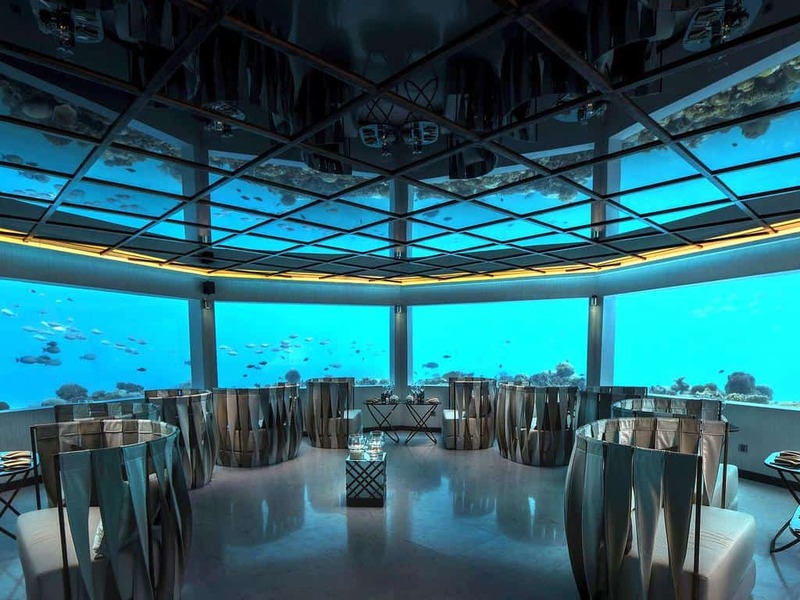 The real USP is, of course, the underwater restaurant. Wine and dine in style as colourful fish and manta rays swim by. This is the main restaurant of OZEN. With panoramic ocean views and great international cuisine, this is an ideal place to have breakfast, lunch or dinner. If you want a bit of local flavour this is a great choice. Rooted in South Asian culinary traditions, IndoCeylon serves a mix of Indian, Maldivian and Sri Lankan cuisine. Take a culinary trip to the Far East and experience a range of classic Chinese dishes. If you look out of the wooden overwater villa you’ll see sharks swimming by as you tuck into your caviar. 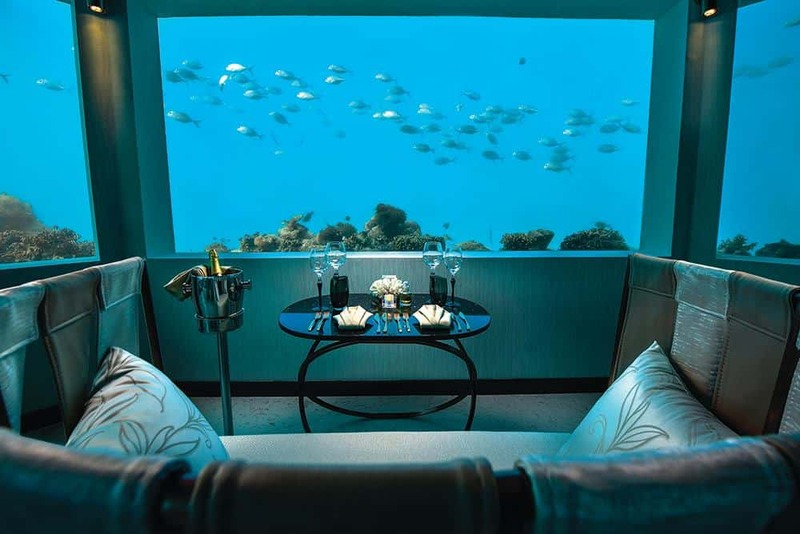 The piece de resistance is undoubtedly M6m, the resort’s exclusive underwater restaurant. As you descend the winding staircase into the restaurant, you’ll see thousands of fish swimming by – especially during the daylight. The food is exquisite. Think butter poaches lobster and squid ink tuile. This is the pool bar and pizzeria. An altogether less formal affair, although still very chic. A wide array of cocktails are available for you to choose from along with a selection of snacks. This bar has some of the best sunset views in South Male. R.A.W. is, as the name indicated, a sushi restaurant. Open at lunchtime, pop over and see the sashimi chef working wonders. If you like gin you’ll do well here. With 25 top gin brands to choose from, there’s no reason to leave this bar sober.